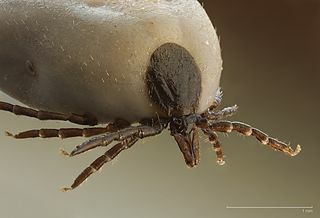 Dermacentor reticulatus, also known as the ornate cow tick, ornate dog tick, meadow tick and marsh tick, is a species of tick from the family Ixodidae. It is the type species for the Dermacentor genus. ↑ Harrus S, Perlman-Avrahami A, Mumcuoglu KY, Morick D, Baneth G (March 2010). "Molecular detection of Rickettsia massiliae, Rickettsia sibirica mongolitimonae and Rickettsia conorii israelensis in ticks from Israel". Clin Microbiol Infect. 17 (2): 176–80. doi:10.1111/j.1469-0691.2010.03224.x. PMID 20331680. ↑ Parola P, Paddock CD, Raoult D (2005). 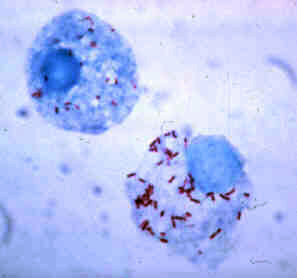 "Tick-Borne Rickettsioses around the World: Emerging Diseases Challenging Old Concepts". Clinical Microbiology Reviews. 18 (4): 719–756. doi:10.1128/CMR.18.4.719-756.2005. PMC 1265907 . PMID 16223955.